WTF Do I Wear To a Tailgate? Ah, tailgate season. What is it about standing around in a parking lot with a cold beer in your hand, discussing the finer points of your alma mater’s defensive strategy that just feels so right? Maybe it’s the sense of community you get looking out and seeing all those thousands of people, decked out in your colors, doing exactly the same thing. Maybe it’s experiencing exactly zero shame for getting giddy when “the wave” comes your way. Maybe it’s the hot dogs. Tailgating is a great excuse to reminisce about your college days, but it’s not a great excuse to dress like you’re still trying to decide between sociology and psychology majors and sleeping past noon in a twin XL bed on the regular. You want to arrive back on campus looking like an aspirational beacon of post-grad success… Who, you know, can still hang. Spirited but sophisticated, if you will. First thing’s first: think beyond the bookstore at the student union. Brands like Hillflint, Ebbets Field and Stance make the kinds of cool, retro-inspired gear that shows your allegiance without shouting it from the nosebleeds. You know, the kind you can get away with out in the real world, too. Take one of these cool pieces and fold it into your grown man weekend wardrobe for a winning tailgating look. Hillflint has stylish, vintage-inspired collegiate gear for more than 120 schools, and their specialty is sweatshirts and sweaters. You can go big, with throwback sweaters sporting bold colors and big logos, or more subtle with their classic crew sweatshirts, like this one. Sport (ha) either style with jeans, white sneakers and a down vest for the perfect “adult tailgater starter pack” look. You may or may not know this, but American Eagle’s Tailgate brand (founded by Todd Snyder and sold to AE in 2015) is an expansive, affordable resource for all kinds of collegiate gear. They carry super-soft t-shirts, sweatshirts and half-zips for more than 50 schools, all of which you could get away with wearing off-campus too. Think retro logos, ringer tees and hoodies that are way more comfortable and fit better than the scratchy generic stuff you’ll find at the bookstore. While Ebbets Field does carry some collegiate apparel, what we’re really here for are the hats. The brand has resurrected designs from the schools’ archives for their selection of infinitely wearable “low-key fan” flannel caps. Think Yale in 1948, Michigan State in 1954 and even a University of Colorado design from way back in 1924. Preppy tailgaters, this one’s for you. 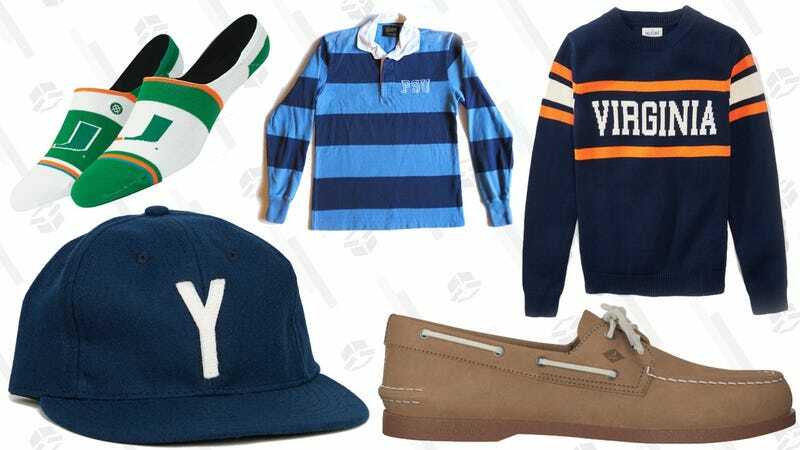 For the truly committed fan, we support going all-in with a pair of customized Sperry boat shoes repping your school’s colors. You can mix and match leather colors for every part of the shoe, creating the ultimate leisure footwear for (warm weather) game days. We know that tailgate season is not a crisp fall air, apple cider with whiskey and turning leaves affair in every corner of the country. For our California coast and Southwest tailgators who will be comfortably hanging outdoors in shorts well into December, why not trade your t-shirt for some festive socks? Stance makes really fun logo and mascot socks for 34 major college teams. We recommend going “full Cali” and wearing them with said all-season shorts and of course, your Vans.